We are going to introduce you to some very Powerful Super Mineralized Vodka Elixir Drink Recipes that can be used in a variety of ways for Health and Wellness. Did you know “Super Mineralized Alcohols” can be used as a beneficial therapy if used correctly, and with the correct minerals and supplements / powders to make the “Dry Alcohol” very effective in many ways depending on the recipe. Please refer to Vodka Skin Cleaning Solution for the Basic Vodka Recipe! We will be doing 2 recipes: Mind Activating Vodka Elixir Recipe and Small Intestine Detox Vodka Recipe. 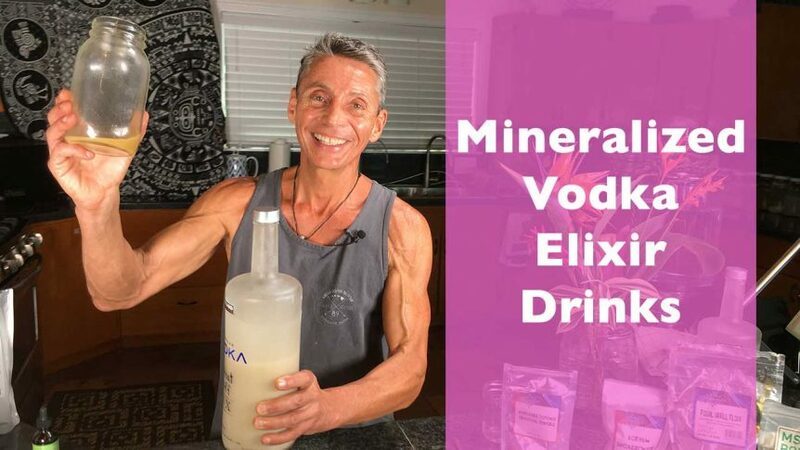 Yes, these are Super Mineralized Vodka Elixirs that I use to produce various profound effects in our Terrain Modification detoxification and rejuvenation programs. They are part of the Terrain Modification protocols, practices and principles to be guided on for sure, and never operate machinery of any kind when using these Super Mineralized Vodka Elixirs. It’s all a work in progress and if used right this Vodka Elixir will super support cleaning of the small and large intestinal tracts, and other areas of the body using the alcohol with the various minerals and powders. Learn how to make and practice the Skin and Pore Vodka Alcohol Elixirs recipe for Profound Detoxification and Rejuvenation. Hi, I’m new and trying to figure things out. I hope someone will help me. I’ve been watching dr. Cassar’s videos for a while. Thank you so much for these videos. I requested information for the retreat but no one responded….I’m sure you must be getting messages from all over the world. So I decided to try water fasting on my own. I’m on day 16 of water fasting in hopes of improving my life. Last night was the second time I did the shot glass for small intestine detox. How many days do you do this? Is it only once a day? How do you know you are finished cleaning the small intestine. From what Dr.Cassar has written, it’s pretty long. Can someone help me. Great you’re using the protocols and seeing results! There’s no set standard of when, how or how often to use the small intestine detox drink. However, If you’d like to set up a consultation we can get that going. The general rule of thumb we have for that drink is if you’re feeling the effects of alcohol, then you’ve taken too much and it’s not necessary to use the drink every day. To fully clean the intestine will take a long time and great diligence to maintain healthy eating and living habits, it’s called the great work for a reason to maintain this physical temple. Hello, I’m a new member and hoping to see the videos for the mineralized vodka elixirs Part 2 and I can’t find them. I’ve searched the site and it just brings me back to the same page without granting access to the paid access videos. Dr. Cassar doesnt show how to make the “basic vodka recipe” in these videos. I found another one of his videos but it seems he is making a vodka recipe for skin cleaning. Is this the same basic recipe for consumption? I am leaving comment here because the actual video for this drink does not have a comment section. Hi Dr. Cassar, just recently became a member. I tried Potassium immunity booster drink; the only two ingredient I did not use were ascorbic acid and Mucuna; I did not have the fuzz like you did in your video when you added potassium bircorbonate, Is that because I did not use those two ingredients? How often should I have this drink? Thank You for everything. Aloha Anant :)) Start out with 16-32 ounces of distilled water, RO water or just clean water … I then add a full squeezed large and juicy lemon – 1/2 MSM is good to add too – then add the magnesium trace ionic minerals and silica minerals too – Now by adding 1/2 – 1 tsp of Potassium bi-carbonate (the more you add the more of the reaction you will get) and stir you should get bubbles and when drinking it try to keep all of the burping in. Give it a try again … Its all personal and collective research, experimentation, becoming your own Doctor and don’t forget scientist too.